It’s been unseasonably cold in DC this month and I’m eager to trade my ugg boots and puffy coat for Jack Rogers sandals and shorts. As a result of this nasty weather, I’ve been clinging to comfort foods lately—pasta, soup and old time favorites. For years I was scared to try making my own risotto because of the time involved and cumbersome technique. I’ve tried the boxed varieties and let’s face, they just taste…processed. Recently I’ve conquered my fear and tried making my own from scratch. After a few attempts I think I’ve mastered the art of Arborio and it’s really not that hard. The cool thing about Arborio is that it’s a blank canvas—it will take on the flavor of just about anything you add to it. One key ingredient to never leave out though is wine. Wine makes everything better (you can also be fancy and add Champagne…drink it while you cook and feel fabulous). Don’t worry I won’t judge you if you buy André because it all tastes the same to me. 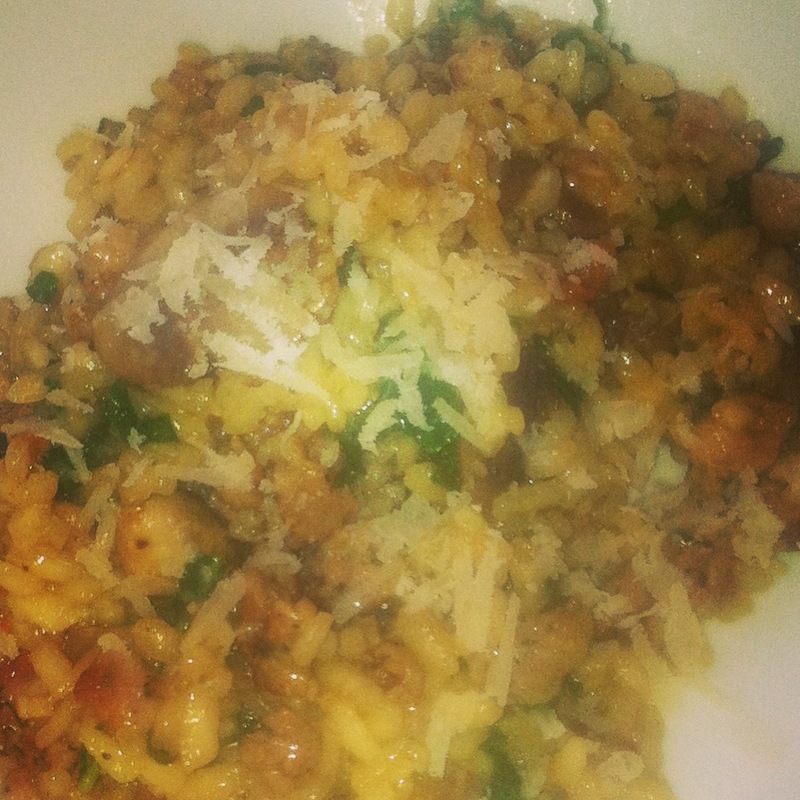 I just had a thought; champagne risotto with lobster, how awesome does that sound? I’ll save that for another post… like a Valentine’s Day or something, stay tuned. In a small pot on your back burner, heat the broth and water. When it almost reaches boiling point, turn the heat down and keep it warm while you do the rest of the cooking. In a large saucepan, sauté your mushrooms in olive oil until they are browned. Season with salt. When they are cooked through and release liquid, remove from the pan and put aside. Add the sausage and cook until browned and crumbly, then add the onion and garlic. Cook for about three minutes, stirring constantly. 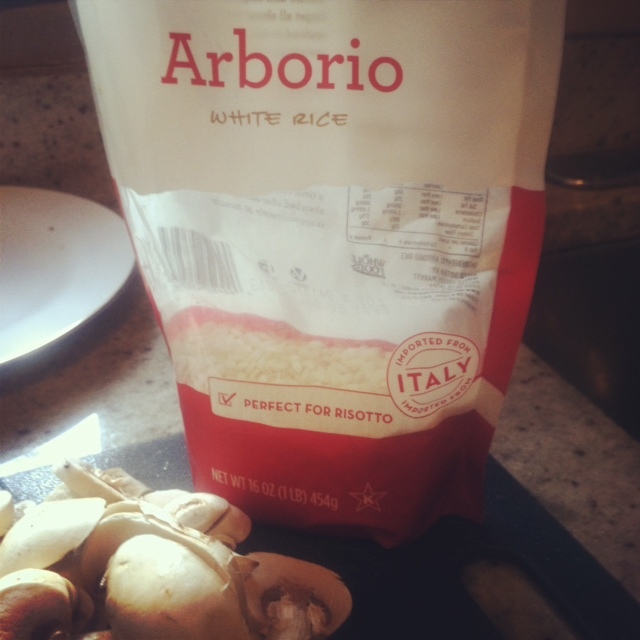 Add the Arborio, stir it in and let it toast, about one minute. Add the wine and stir, deglaze by scraping the bottom of the pan. Make sure you leave in all those brown bits! Stir in a half cup of the broth mixture and stir constantly until the liquid is absorbed. Add the rest of the broth, just 1/4 cup at a time, constantly stirring until absorbed before adding more. This will take about a 25 minutes (sorry…hey, you can get an arm workout in). Once you finish this, remove the pan from heat.Add the mushrooms, kale and parmesan and stir a minute or two until the kale begins to wilt. Serve with an extra mound of cheese on top. Note: I used a chicken sausage with basil and sundried tomatoes (whole foods) for this recipe, but feel free to use pork or turkey sausage, whatever you fancy.